I’ve teamed up with Alexian to bring you this post. Welcome back to Part II of French Entertaining! In our last post French guest cook Sandrine Vannson enlightened us on French entertaining “country style” with Duck Rillette and Pheasant & Rosemary Pâté. The interest and participation was exciting and now we’re back with the second installment in which we’ll be taking a more contemporary, or “nouvelle”, approach. We are delighted to have Sandrine back with us where she will be sharing some more creative ideas, this time with mousse and vegetable pâté, using some more of Alexian’s fabulous products. Alexian is America’s premier producer of the finest pâtés and mousses all made with the finest, freshest all-natural ingredients and without any preservatives, additives, hormones, antibiotics or fillers. Today Sandrine will be featuring Alexian’s Duck Liver Mousse with Cognac and their Vegetable Pâté. 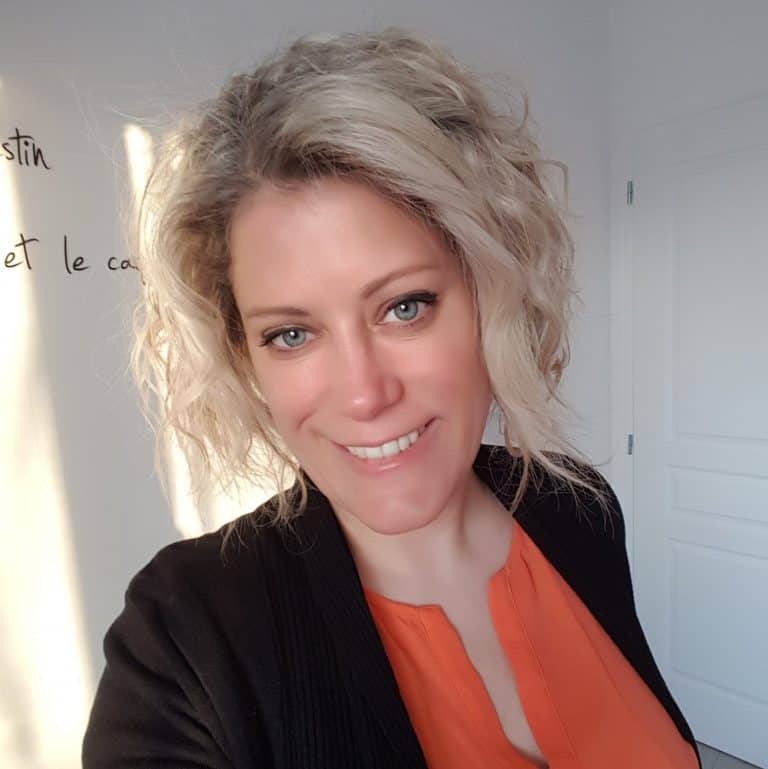 Let’s turn the time over to Sandrine who will show us some inspiring ways to create beautiful and delicious French appetizers. 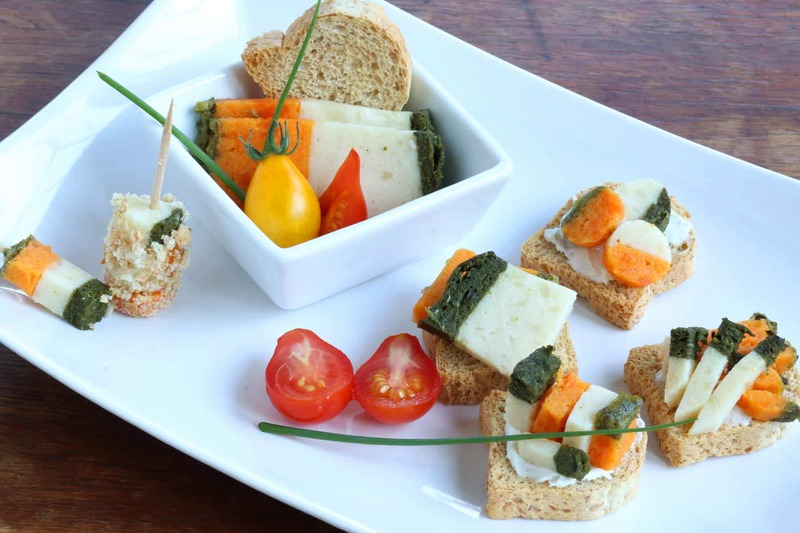 These appetizers are absolutely perfect for any special occasion and are sure to impress your guests! The vegetable pâté is not something I work with a lot and it’s a shame. Not only is it tasty but it is also healthy. These kinds of pâtés always induce the idea of refinement and sophistication and yet they are so simple and you don’t have to worry about watching the extra calories. The combination of flavors makes it so interesting and fresh. You can either eat it by itself or on toasts or combine it with any number of selections from the delicatessen. The options are endless. Here I’ve chosen to display it in three different ways on the same plate . The simplest is to cut the pâté not too thinly nor too thickly to have a nice slice that won’t fall apart when you will display it. You have to be careful because this is not as malleable as the other products. Cut 2 or 3 slices depending on the size of your serving dishes . First, cut slices and then use the pastry cutters to cut shapes in the slices so you can vary the shapes, the flavors, the placement. Put some cream cheese (just a little so the different pieces will stay in place without interfering with the taste of the pâté). Here are some ideas of what you can do. So simple and so good. For the second version, I decided to make an individual portion. Cut 2 or 3 slices depending on the size of your serving dishes . Place the slices in a little white ramekin with a toast for the crispy side, fresh tomatoes from the garden and chives . You can really use anything to accompany vegetable pâté as long as it’s fresh. Just give free rein to your imagination and dare trying new combinations if you are adventurous. You can also choose to display the whole pâté and then let your guests help themselves. My last idea is really simple too. Cut a thick slice and then cut into strips. Stick a toothpick in each piece. If you want to add a crispy element, roll the pieces in bread crumbs (on left in pic below). That’s all there is to it! Now let’s move on to the mousse. Here is another fun thing to make. I usually use fresh goat cheese for this but we’re going to try it with duck mousse. I like challenges! So here we go! 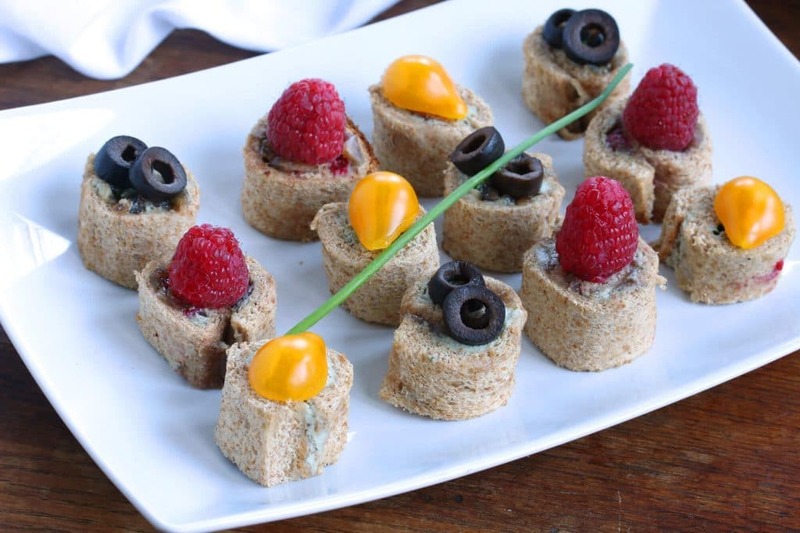 To make a duck mousse “maki style” appetizer, you need sliced bread (white or wholewheat) . Take a slice and flatten it with a rolling pin. Once it is flattened, cut off the crusts and spread the slice evenly some duck mousse . To fill the roll, you can lay some chives and pieces of pickles or maple caramelized onions (the recipe is in our previous post) with fresh raspberries (Yes, it does work very well together!). You can also combine the maple caramelized onions with chives and olives. Once again, the possibilities are endless. Start at one end of the bread slice and tightly roll it up. 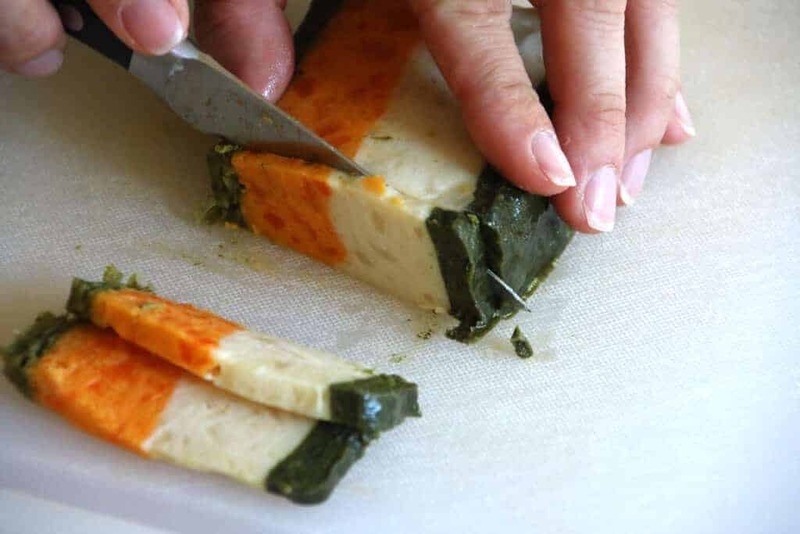 Once you are done, cut the roll into slices. Place your maki style appetizers on a plate and add some flavorful garnishes on each “maki”. Now you just have to enjoy them! Bon appétit! 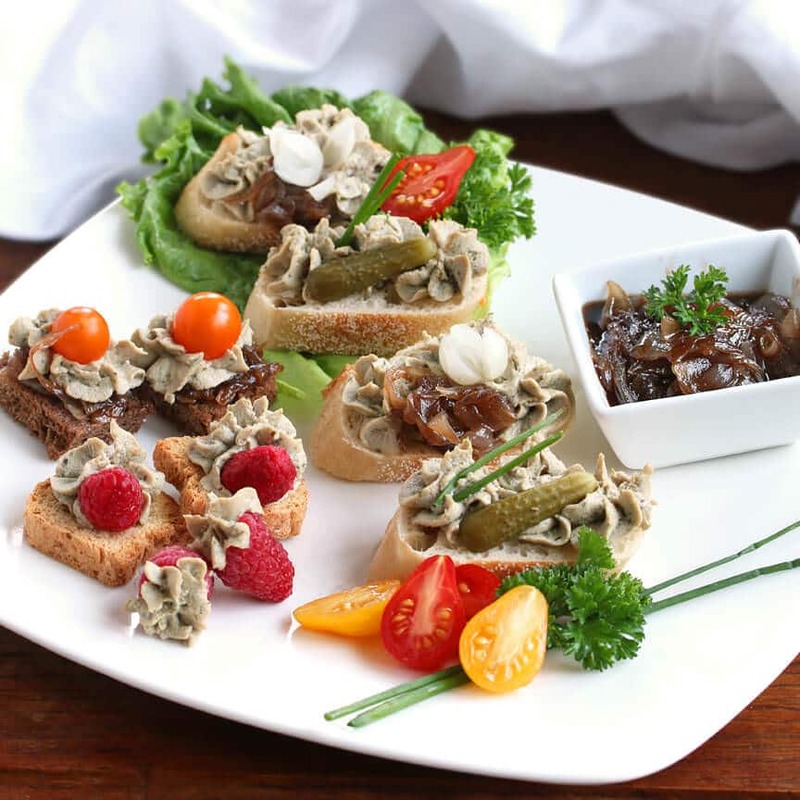 Our last version for the duck mousse toasts is a little more sophisticated and elegant and yet so simple to create. To make them you will need to slice a baguette, not too thinly. Toast them a little so they can stay nice and crispy even if they wait a little. To be able to work the mousse better, you will need to add a little bit of fresh cream or whole milk and mix it well so it can be put in a pastry bag. Then let your imagination do the rest of it. I personally did roses as it it easier to place on toasts. Once you’ve done your roses or other shapes with the mousse, add some garnishes. Anything pickled will go perfectly with it like pickles or small white pickled onions. You can also try it with fresh raspberries (oh, it’s so delicious! ), chives, cherry tomatoes or our maple caramelized onions. You can even fill some raspberries with the preparation. It’s fresh and very tasty. Once again those are just few ideas of what you can make. You just have to dare trying new flavors. With all those yummy toasts you can be sure everybody will find what they are looking for. Now it’s time to relax and enjoy. We hope you’ve learned a bit about French entertaining and have been inspired to try some mousse and pate at home! To find a store near you that carries Alexian products, go to their Store Locater. A special thank you to Alexian for sponsoring this post! As always, all opinions are entirely my own. These would be a wonderful addition to my small SuperBowl get together. The pate variety sounds interesting! thrill this would be to receive. Bless you all for bringing great products to enjoy! party alone eating. He has another carpel tunnel surgery in Jan. We are looking forward & ARE BLESSED THIS YR. This is so awesome. I would definitely host a get together with my girlfriends and wine is always included. 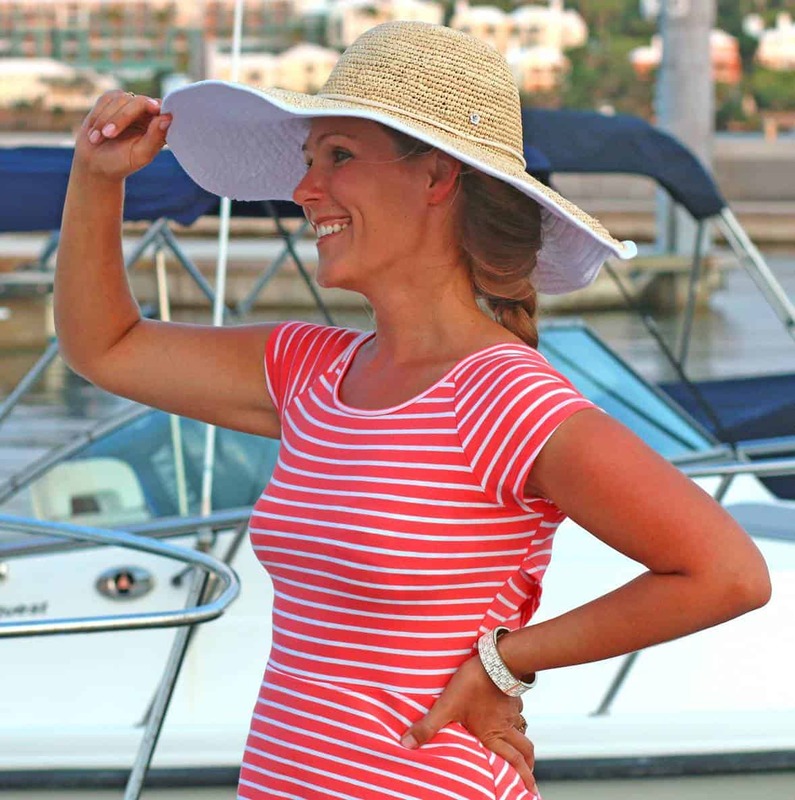 I think this would be great items to pair with wine and it would be lovely to get together with my friends! Something new and unique is always welcome! A PARTY WKEND FOR US! I’m sure there would be gone within minutes at any holiday party! Would LOVE to taste and try your ideas and try a few other ideas of my own. We take turns with a few other couples, serving snacks and dinner bi-monthly. Then they may like to try some of your french goodies also. What a lovely appetizer array!! I want to try everything! I think these pates would be perfect for a New Years Eve spread. I’m always looking for something different. I’m landlocked in the USA right now so anything new (to me) and fresh is on my radar. These look lovely and unusual when compared to my daily fare. How cool! 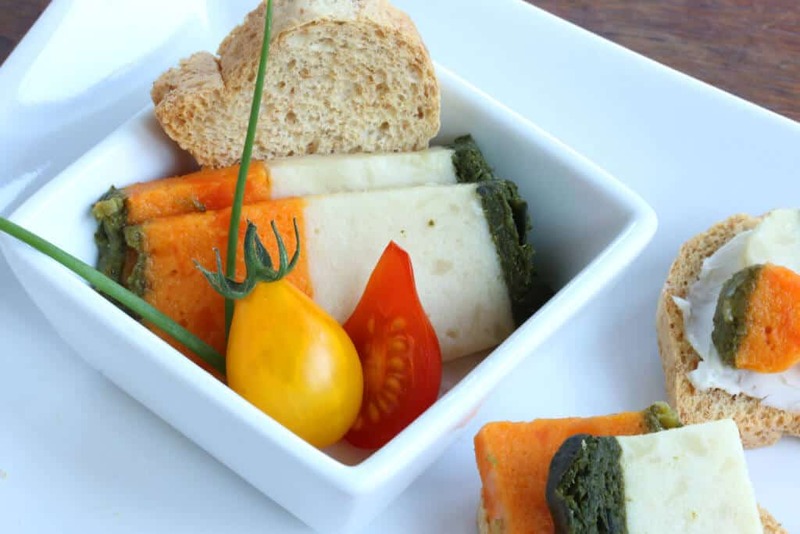 I haven’t ever had vegetable pate but it looks and sounds amazing! I’ve never tried vegetable pâté actually but would love to! So many delicious appetizer being served here. YUM! Oooh vegetable pate?! I’ve never tried that, but I need to, it looks wonderful! This looks so fun! I love the variety of flavors! Perfect appetizer for any party! Such fun appetizers! These would surely go fast in this house! I would love to win and sample this amazing prize for Valentine’s Day. Thanks! These would be fun to serve at my husband’s birthday! I am so glad you have the store locator link. I was so intrigued the last time that I searched for Alexian products at a store I really thought would have them, but came up empty. I suspect it will require a drive–but I feel pretty determined! :) To answer your question, I just love the idea of serving these as finger foods when I have all day guests that are waiting for dinner. Amazing! I love that vegetable pate. Now I wanna have a party and serve up all these tasty treats! 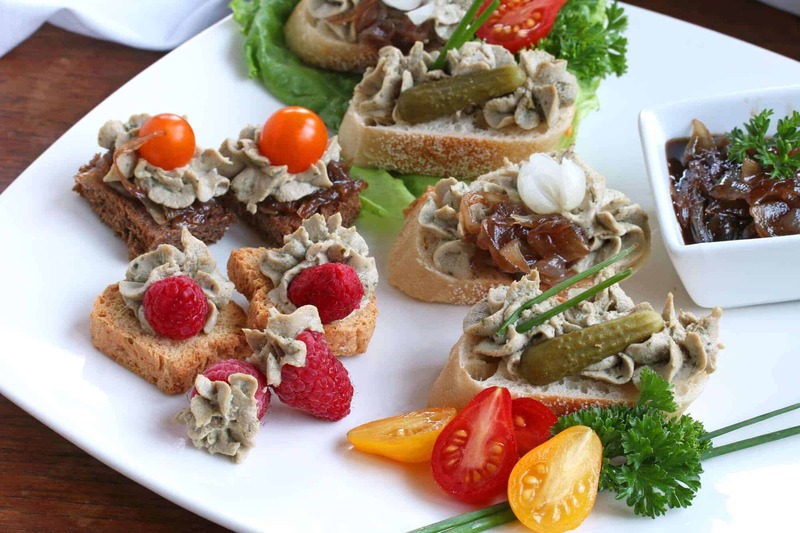 A vegetable pate is a fabulous idea. It is beautiful and healthy. I have to make one for my next party. As a southern I entertain a lot. 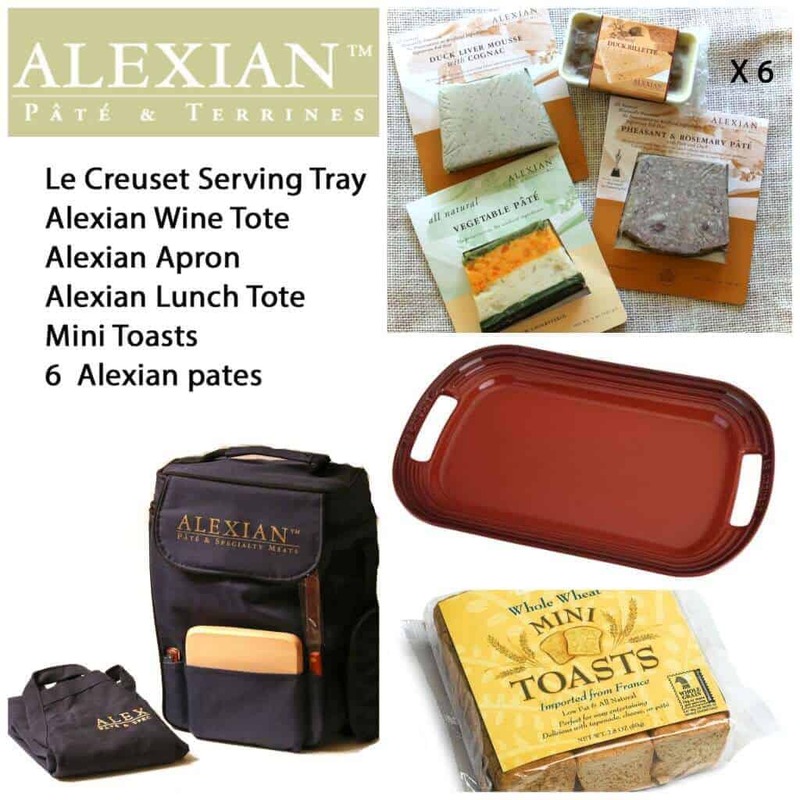 Alexian products especially their pate is the best quality you will find in America. I like serving my friends the best is one reason why I would like to win. Super Bowl would be fun or maybe a party for two this Valentine’s Day. I would love to use these as a bridal shower! I needed something for this weekend, and this gives me lots of ideas! I would use this when we have people over for the Super Bowl! 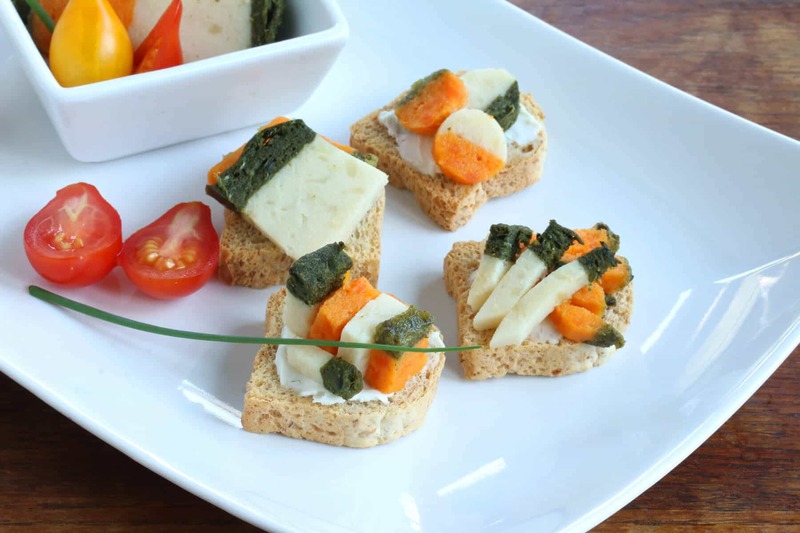 Great appetizer ideas! They are prefect for an elegant holiday dinner party! 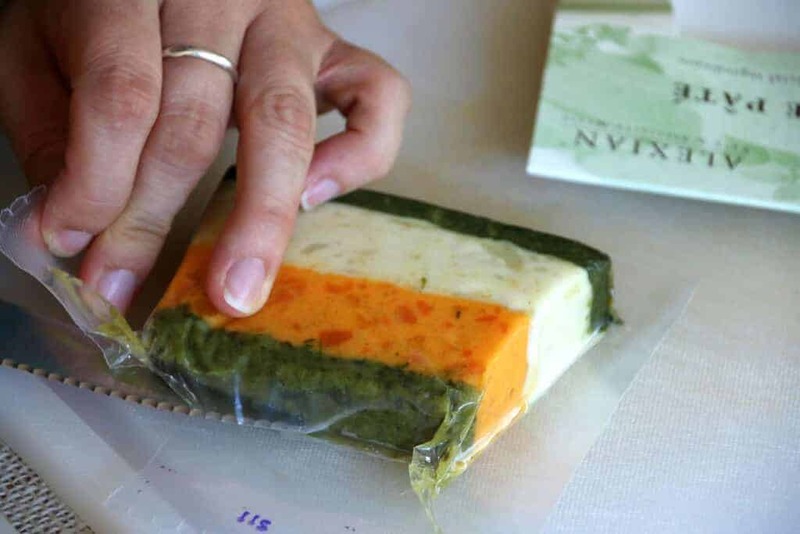 I have never tried the vegetable pâtés. I will definitely give it a try! Perfect for my garden party. I’d like to try Alexian products because I love good food and they all sound delicious! I don’t eat enough Pate!! Would serve them on Valentine’s Day or at an upcoming birthday party. That vegetable pate is calling my name! Is it against the rules to eat a slice of that for lunch, because I totally want it! I also love her technique to roll out the bread and spread with pate. Genius! I would enjoy this my girls for card night. Why would I love to try these? Because who doesn’t love to eat GOOD food? Food a cut above the rest? I do! I would really love to try out Alexian foods for sure. We get together often, for any excuse! Birthdays, holidays, just because tis Fridays! And this food would go so well with Wine sampling, too! I’d love to try these for a romantic dinner at home. Wine, candlelight, some cheese and pâté…perfection. These look so amazing and delicious! I’d serve them at a girls night! I Would Love To Try These, I Imagine It Would Be Perfect For Brunch! I would love to serve the Alexian foods at my next family get together, maybe even for the Super Bowl! I love to try new things! One can say I am a Foodie!!!! I would use them for a quiet night when Our toddler goes to bed and share it with my Husband! I’d love to win because we are always having company or we are going to a friend’s. Would love to serve on the try and take along the wine. I love to entertain at home and this would be amazing to serve to my guest! This would be a great addition to my kitchen essentials. I love cooking and entertaining people in our home. Would love to use the set on Valentines get together with my friends and family. 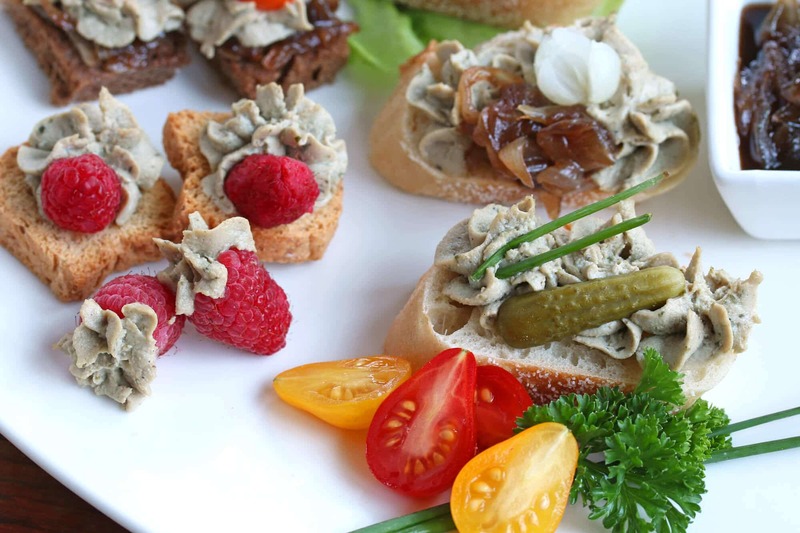 I’ve never worked with vegetable pâté before – it sounds lovely. I entertain for a lot of vegetarians, so having a non-meat pâté would be great! How fabulous for a romantic evening in with my husband! I would love these to help serve for my friend’s 40th wedding anniversary party in a couple of months. They would add just the right touch.